During my most recent trip into the operating room (last April), the anesthesiologist smiled down at me on the operating table and said, "Think of a happy dream ..." before hooking up my IV and placing a mask on my face. "Shopping ..." I murmured dreamily as I drifted off to my happy place. And dream of shopping, I certainly did. In fact, the Marc Jacobs orange jellied gladiator sandals at Bergdorf Goodman were so vivid in my mind that as I reached out for one of their shiny new straps and was rudely woken by a surgery nurse pulling out one of my breathing tubes, I yelled, "OH MY GOD!!!" not out of pain, but out of annoyance. "WHY DID YOU WAKE ME UP??? I WAS HAVING THE BEST DREAM!!! I DREAMT I WAS SHOPPING AT BERGDORF!!! HOW DARE YOU!!!" "Ma'am, calm down," came the placid response. "You've just woken up from surgery. I need to wheel you to the recovery suite now." I didn't answer. I was extremely irritated. She could have at least waited until the part where I try them on and admire them adoringly in the mirror, but no. A dream cut short. Most of my pre-teen, teen, and - who am I kidding - 20-something years were spent at the mall. Any mall. When I was bored, I went to the mall. When my mom and I wanted to spend "quality time" together, we went to the mall. When I was happy, I went to the mall. When I was down ... you get the idea. At college, we didn't live near a mall (we didn't live near anything, for that matter - MHC was in the middle of blissful nowhere, in the heart of the Pioneer Valley of Western Mass), so Udita and I would take the weekly "mall bus" to Holyoke Mall (which has got to be THE most depressing building in the world for lack of natural light, not to mention the skanky locals - sorry, locals) for a three-hour break, running from H&M to Forever 21 and never getting tired of it. And we had to get a bag of Mrs. Fields' Cookies. And occasionally nasty sushi from the food court. And recently when I was home for Christmas, my mom would excitedly tick off the shopping adventures we would have on her fingers: "I was thinking, Monday, Dad can leave work in the middle of the day to take us to South Center Mall since I don't want to drive there, and we can go for about 3 or 4 hours until I have to teach. Tuesday, I was thinking we could go to the Supermall early in the day and you know, you can find some work clothes at BR or Nordy Rack. Wednesday I get a 10% senior citizen discount at Marshall's so we can go to Marshall's then, and Ross is next door but I was thinking we could go to Ross in Federal Way on Thursday as well since they have another Marshall's there too. Friday, we should go to Macy's at the South Hill Mall and since I don't have to teach we can even have lunch there and then walk the rest of the mall if you're interested." Then she'd smile brightly at me. "How does that sound?" So you can kind of guess how I felt when I found out there aren't malls in England. Devastated. But there is the "high street" - it's like a mall, but outside and not ... um ... mall-like. So think of Oxford Street, which is basically a couple (or more) miles of stores stretched out, facing each other. At first, I was confused. "But ... but ... where will I lunch? Where can I have my mid-shop-rest-my-feet-break?" And the answer is that you simply don't do either, or else duck into your nearest Pret, Eat, or Starbucks for such breaks. You don't "hang out" on the high street, you have a mission, a purpose. You're there to shop and not necessarily to enjoy the experience. I'm not saying the mall experience makes my shopping more enjoyable, but there's something about the carpeted seating areas, the bright lights, and the suited and booted sales assistants in the shoe department of Nordstrom, eager to fetch me both a pair of size 7 and 7 1/2 heels that I really, really love. 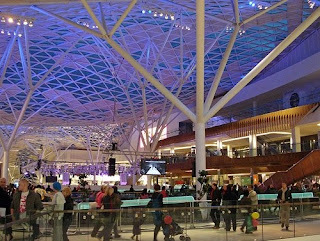 When Westfield opened in Shepherd's Bush, I jumped and clapped with glee. Even we have Westfield in Washington (formerly known as South Center). Finally, something familiar, something American - a real mall. But Londoners refuse to call it a mall. It's either referred to as "Westfield" or by its full name, "Westfield Shopping Centre". Hell will freeze over before Britons refer to any "shopping centre" as a "mall". And I was not disappointed by my first 5-hour (yes, FIVE hour) visit there with Udita last year. All my high-street favorites in one place, without having to duck in and out of the rain or shove through people on the sidewalk. At Westfield mall, I feel at home. You need to come to the Gulf. Dubai should be your next vacation. MALL HEAVEN, LIKE THE UTTERTOP RUNG OF HEAVEN. Yeah, John was just there and didn't like it - I think that's why.